friend. For his upcoming 50th birthday he wanted to do a road trip in the USA in a classic muscle car, this was something we looked into a few years ago and the cost were understandably bonkers, so we did it in a modern Pontiac. We threw the idea out, that for a slightly higher cost you could probably buy a car in the UK and do a European road trip instead and still have the car afterwards, having owned US vehicles over the years I had seen the prices of muscle and pony cars rise out of reach of our perceived budget. However, the 1970's C3 Corvette was still an undervalued car, despite being one of the most iconic and recognisable car shapes ever. A quick internet search showed usable cars from �, with nice spec, dry state cars being around the �-�k mark. A plan was hatched, we would both start searching for a suitable car for our road trip. After some discussion with our respective wives on year/spec, we wanted a 78/79 with the larger back window, ideally black. Our friends wanted a 80/82 shape with the slightly redesigned front and rear ends. Ebay turned up a few candidates, but they were soon discounted for various reasons. 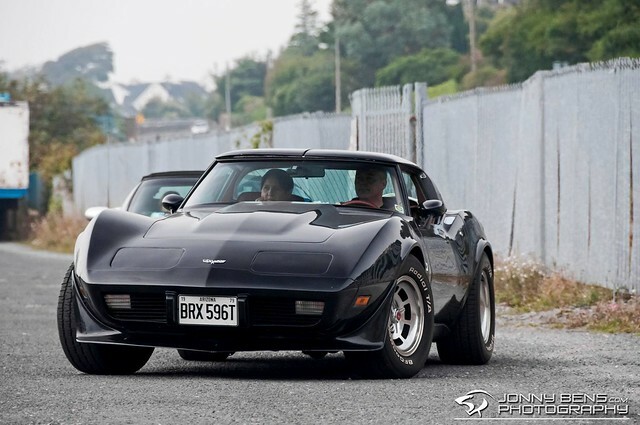 We then happened across a 79' advertised on the Corvette Club forum. While not quite black, it was a very nice deep grey metallic, with a stunning dark red leather interior. Imported from Arizona in 2006 and While outwardly quite stock looking, it had benefited from a brand new crate motor in 2010, it was also fitted with the desirable 4 speed Autobox. Being located near Windsor meant a lengthy road trip to view, but it was worth it. A deal was done and the car delivered up to Stockport in December 2013. Shortly after our friends located a black 80' in Dorset, the plan was shaping up. In short, the plan was loose, we would venture into France in September 2014 and see what each day presented us and took us, over the next few months we had the odd conversation where a little doubt stepped in, what would happen if we broke down, bit of a language barrier etc. 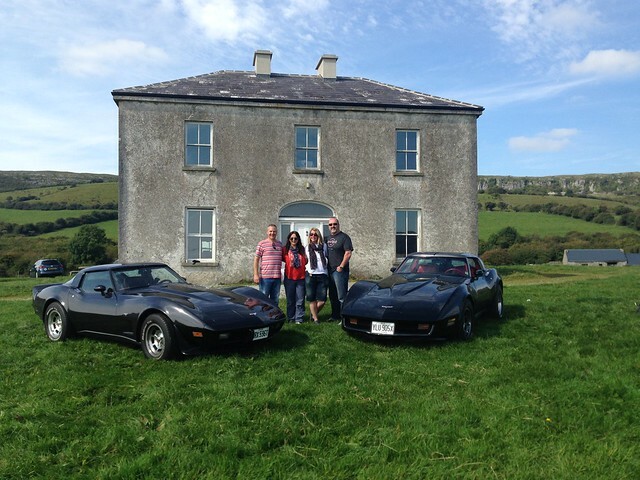 Around the same time, on the Corvette Club (which we had now joined), there was a member from Ireland organising a bit of a road trip in September, it was proposed as a 4 day trip, but we decided we could stay on longer. and C6's.All planned, car serviced and possible spares obtained and we were off to catch the ferry from Anglesey to Dublin. We met our friends at the American themed OK Diner on the A55 and had a little convoy down to our overnight stop at Holyhead, ready for the fast crossing the next morning. At the port the next morning we met David and Jan in their Corvette who were also taking part in the meet. A millpond smooth crossing and we were soon off the boat and into the Dublin traffic, we had plenty of time on our hands so we bimbled South and took the odd detour on our way to Dungarvan to meet the others. Over the next few days we had a great time visiting some fantastic sites and sights around Southern Ireland, we even kissed the Blarney stone! As a special treat, we had secretly arranged to visit the house used in Father Ted, then winding back toward Dublin for the ferry back to Holyhead and then home. All in we did 1200 trouble free miles.